Jonathan David: French Bulldogs are really good at sitting around and being cute. Narrator: And no one will argue with that. Natalie Feldman: He’s not a dog, he’s part of my family. Tyson Kilmer: I love the French Bulldog. Narrator: The pushed-in face, the adorable snorting, the French Bulldog. Surprisingly the French Bulldog actually comes from England. During the industrial revolution English artisan workers especially lace makers have little companions around to improve the quality of their lives. They turn first to a dwarf version of the English Bulldog then cross that with the Pug and the Terrier. And boy did that calculated crossbreeding work. Frenchies come in brindle, fawn, white and blac, and a mix of all those colors. They usually stand between 11 and 13 inches tall and should weigh over 28 pounds. Because they’re so top-heavy they can’t swim. They’re more anchor than buoy. Part of the reason for this is their characteristically smushed-in face. Frenchies are known as Brachycephalic dogs. This refers to dogs with short noses. Frenchie’s have a very short head compared with the length of their cranium; oftentimes this results in either an elongated or cleft soft palate. 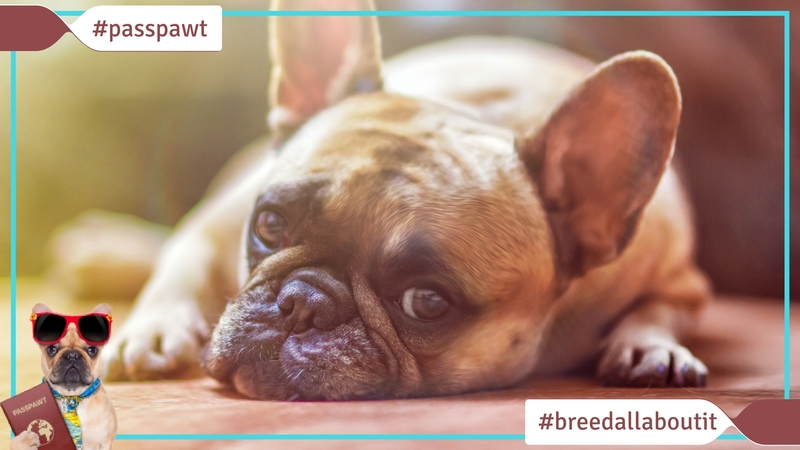 Andrea Arden: Brachycephalic dogs, dogs with push faces do tend to have a lot of health issues. Narrator: This makes them noisy labor breathers. For this reason Frenchie’s are not comfortable in heat or playing hours of fetch. This adorably smashed-in face gives way to one of the cutest characteristics of Frenchies – their face wrinkles. These wrinkles are a genetic hand-me-down. Bulldogs were bred to have these wrinkles on the face to flow blood away from the eyes should the dog be wounded in a fight. Another Frenchie must, those bat ears. Bred to have perked bat-like ears, early breeders preferred droopy rose ears, but now all Frenchies have to have bat ears. And lastly the French Bulldog has some serious reproductive challenges. For one it cannot naturally reproduce, because it is so top-heavy, has such narrow hips and weak legs the mail cannot successfully mount the female. They need to be artificially inseminated. Andrea Arden: Because they have such large heads in portion to the rest their body that when the dam is trying to pass the puppies, oftentimes the canal, the opening is not big enough. Narrator: All of this makes the breeding tricky and consequently a bit more expensive. But on the flip side you can be sure that your dog’s heritage was carefully planned. Frenchies are great companions, they like to be near you. So take them on errands. Because they require little exercise they do really well in apartment living situations. Andrea Arden: Probably one of the top three most popular breeds in New York City. Narrator: With a short coat of hair they’re very easy to groom. Tyson Kilmer: It’s basically just a wash and clip the nails situation. Narrator: Be sure to keep those cute wrinkles on the face dry and free of moisture. Because of their special respiratory system they don’t breathe very well, and can also be prone to thyroid conditions, eye irritations and spinal diseases. Although they can be taught some tricks, Frenchies are notoriously stubborn. They never bite but are more interested in being pleased than pleasing you. Jonathan David: They’re really pretty much bred for being the boss of the house. Tyson Kilmer: I consider this to be a great family dog and a great pet. Narrator: Frenchies do well in small spaces, they do have health issues, and they’re easy to groom. These dogs are stubborn but do well with all members of the family. If you scratch its belly it will love you forever.